A girl described as young and very attractive with olive skin, dark eyes and dark hair, checked in together with a blond male in Roper's motel in Pecos Texas on Tuesday July 5 1966. She was between 17 and 20 years old, and wore a solid red bathing suit. He was last seen driving away in a late model sedan. Neither the man nor the woman left any clues to their identities in the motel room. The girl wore dark shorts anda flowered blouse when checking in. The short blond man registered as her husband, wore a white tee-shirt, black trousers and loafers. unmarked grave in the Pecos Cemetery. 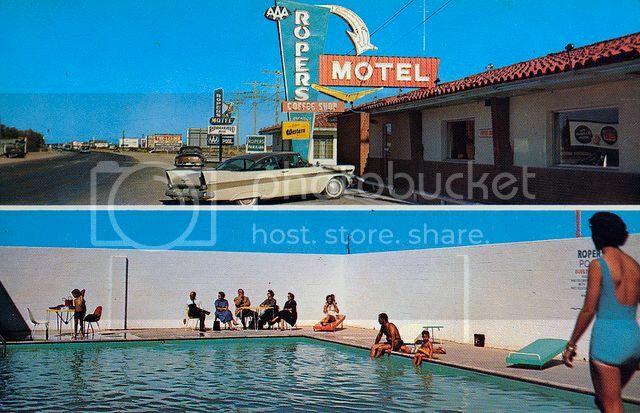 The Roper's motel and pool in the sixties.